As a food blogger, I can be quite fussy and sometimes critical of people’s food recommendations. Especially when it is a cuisine or dish I eat very often. Josiah agreed to treat me to lunch, after the condom prank he pulled on me during the pageant week. I usually go for Korean food at Little Korea in Solaris Mon’t Kiara, but since he spoke highly about Seoul Korea, I decided to give the place a try. The restaurant is located in Plaza Danau 2, above a mamak stall. As we stepped into the premise, we were greeted by the lady boss who looked surprised to see Josiah again. Apparently, he was there for dinner the day before. As soon as Yuh Wen arrived, we ordered our food. Like most Korean restaurants, we were given a selection of banchan (side dishes) – Seoul Korea served about a dozen of them to complement our main orders. Among the banchan selection were the customary kimchi, fried cucumber slices, steamed egg, fermented bean sprouts, cuttlefish stripes, braised egg, par-boiled spinach and a lettuce salad with a tart dressing. The colours, tastes and textures of these little dishes were wonderfully varied – we had two refills of everything. Korean food is often flavoured with fish stock or soy sauce as a base, followed by the sweet flavours from the fruits and spiciness from the acrid Korean chilli paste (gochujang). The waiter does the grilling for you, so all you have to do is wait. 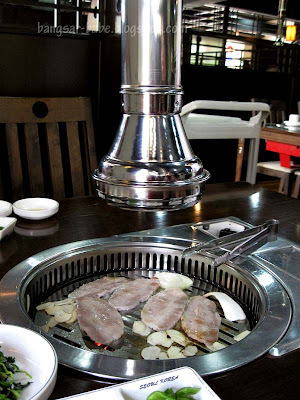 Seoul Korea uses charcoal for their grills, which gives the meat an intense, smoky flavour. Good thing is, each table has a suction fan, so you won’t smell like you just came out from the smokehouse. Between chicken and pork, I always go for the latter, so I ordered the Sam Gyub Sal (grilled pork belly) – RM22. 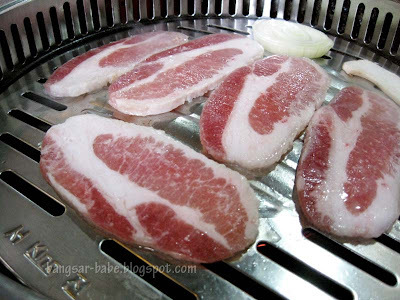 The slices of pork belly were thicker than the ones from Little Korea, so there was more meat and bite to it. I loved the chewiness and slight crispiness of the pork fat – good stuff! Since it is lightly seasoned, I reckon it tastes best with the gochujang and dipping sauce provided. Galbi refers to a type of grilled dish made with pork or beef ribs marinated with Korean soy sauce, garlic, sugar and pureed pear. Apparently, the pear gives the meat a natural sweetness, and helps tenderize the meat. 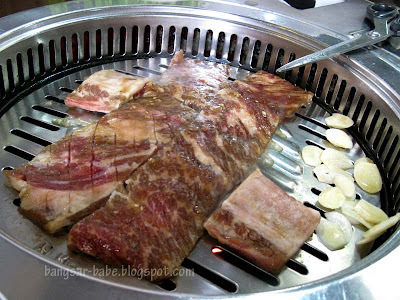 The Bulgalbi (marinated short rib) – RM59 was thinly sliced, and grilled till it was almost the right done-ness. It still retained a pale pink centre, and each bite was tender, flavourful and deliciously smoky. Verdict: Try the bulgalbi and pork belly. I found the food pretty good and value for money. Havent had Korean for ages..! This place does looks promising! Hey girl.. never had a chance to congratulate you. way da go miss popular. kudos!! wow..to all the girls out there..thats some very TOUGH competiton..
haha… what a lovely couple. and witty way to end that post, Babe. 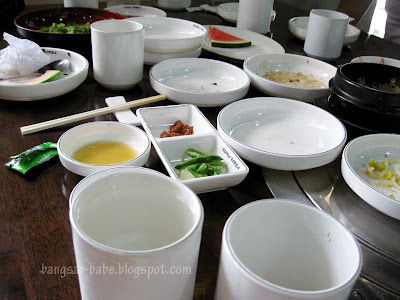 always like Banchan in those dainty porcelain dishes. Oooh excellent… bring on the banchan! This place is walking distance from home… I seem to have missed out on trying the many Korean restaurants on first floors in the area. Oh I am so into Korean BBQ after my affair at Dao Rae Taipan. Definitely gonna drop this place a visit. J2Kfm – Yea…they look super good together!